Description: this smaller species of Ceratopsian dinosaur sports the typical four legged body with a huge horned and plated head. The animal has a body resembling that of a rhinoceros: a heavy, muscled body and a short tail, walking on all fours. Its very large head ends in a huge neck shield, though unlike his famous cousin Triceratops this dinosaur’s shield doesn’t have a round quality to it, but feels more square, adorned with horned protrusions along the edges of the plate and three rows of knobs running down it on the front side. The creature has a large parrot like beak, with one small horn on the nose and two more above its small eyes. Additionally, a smaller horn is found on each cheek. Its plate ends in a pair of horns on either side. The creature stands in an almost neutral pose, except for the tail which is bent somewhat to the left, and its right front leg being raised slightly upwards as if taking a step. This sculpt doesn’t sport an elaborate paint job. It’s mostly dark green, including its legs and most of the head. Its throat, belly and lower part of the tail, as well as the inward parts of the legs, are coloured light grey, while its back and upper part of the tail are painted black, with random rounded shapes running out of this colour, most notably on the top flanks. The area around the figure's eyes and the rows of knobs on its shield are also black. The creature has six orange stripes of various sizes on its back. Of all the horns and protrusions on its head and shield, only the three big horns on its face are painted differently, being white. Its small eyes are also white, with black pupils. The claws on its feet are unpainted. A black JP logo can be found on its upper left hind leg. This animal is electronic and has a dino attack action with accompanying sounds. Pulling the left hind leg back makes the head move upwards, as if striking a blow with it. This also causes mooing sounds to be heard, similar to the sounds of cows, as if the Chasmosaurus is warning its herd of danger. 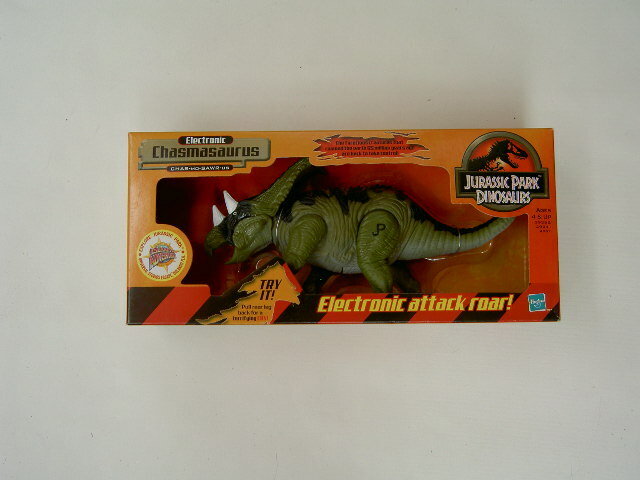 Analysis: another electronic dinosaur from the TLWS1 line makes a reappearance for the first JP: Dinosaurs line, and it happens to be the Chasmosaurus (not Chasmasaurus, as incorrectly spelled on its box, just like happened to the TLWS1 version). It's good to see this pretty cool sculpt again, making it one of the more “obscure” dinosaurs of this line. The sculpt has not been changed, and both the head butting action and the sound FX are good as before. Like its Spinosaurus counterpart of both this line and the TLWS1 line, it has not been equipped with capture gear: it never had any to begin with, and because it's already a tight squeeze fitting this medium sized figure in a box about half as big as the one used before, it obviously didn't need any. Unfortunately, the paint job also has hardly changed. Apart from the addition of the orange stripes on its back, it uses largely the same paint scheme as it did before. The black colouration is applied on the exact same places. Instead of beige, the dominant colour is now dark green. This looks pretty good on this figure though, and mixed with the use of orange over black makes it distinct from its predecessor. Details have largely been omitted. Its claws are not painted, and the same goes for all its horns except the three most noticeable ones on its face. It's also a real shame its beak has still not been painted differently, and so little use is made of the great paint opportunities the neck shield offers. Apparently none of the designers felt up to the task. Overall, it's a disappointing paint job, certainly compared with the original, but it's not a total loss and it doesn't completely ruin the sculpt, which is otherwise still a true charm. Repaint: yes. This is a repaint of the TLWS1 Electronic Chasmosaurus. The figure would not be repainted again. Overall rating: 7/10. This is still a fine sculpt of a relatively unknown dinosaur species not featured in the JP movies. The paint job unfortunately isn't very original, though apart from the black the used colour scheme is at least a bit different than before. This Wave 2 electronic dinosaur is not the easiest find and can fetch relatively high prices, but loose samples can occasionally be acquired at low cost.